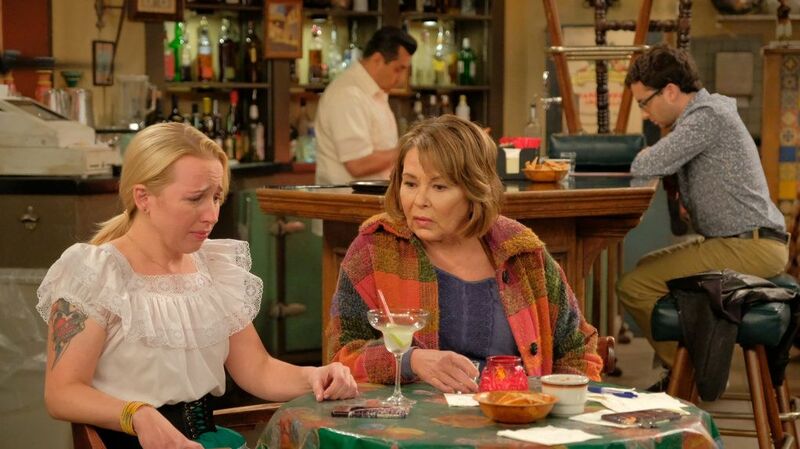 THE jokes are usually a mile a minute on Roseanne, but the next episode of the sitcom will strike an emotional chord. The new series, which reunites the original stars of the hit ’90s sitcom two decades on, has already tackled Trump’s election, modern parenting and bullying. In tonight’s episode, titled Eggs Over, Not Easy, the comedy addresses the death of Becky’s husband Mark. So far in the reboot, Dan and Roseanne’s daughter Becky has been laser-focused on becoming a surrogate in the hopes of finally being able to afford her own home. But a crucial medical revelation forces Becky and her sister Darlene to critically assess each other’s lives. “When that whole storyline reaches its peak you realise how clever the whole arc is,” Alicia Goranson, who plays Becky, tells Weekend. The episode, which American critics and viewers have hailed as the best so far, is dedicated to Glenn Quinn, who played Mark in the original series but died of a drug overdose in 2002. “It was really a beautiful thing to be on set with these people who loved him, me being one of them, and being together to remember him,” she says. Goranson hopes the pivotal episode will allow the show’s writers to explore new avenues with Becky.